It’s a New Year and a great time to create a new financial plan to save. There are many savings plans that people can follow to put aside $1,000 and more. Once the right plan is chosen, it is best to start early and never lose site of your goal. Schedule saving reminders in your phone or set up automatic bill pay that will automatically draft funds from your checking account into your savings account. This year, get your finances together so you can feel good about your financial situation. Almost nothing can compare with the stress from finances that are in disarray. In order to help you become successful, I am sharing my top 7 tips that will keep you from impulse buying. Have you ever walked in a grocery store and saw tons of snacks and yummy treats right in front of you as you begin your shopping journey? This is not a coincidence; especially, if you go grocery shopping while you’re hungry, these snacks can easily entice you to buy food that is not on your list. In fact, the snacks will even appear to be on sale, but even if they are, purchasing snacks that are not on your list will cost way more than you want to spend. So, how do you avoid the distraction that these snacks will cause? When you walk into the store keep your eyes above you on the aisle signs, don’t look down or straight ahead at the treats. Also, when you create your shopping list, it’s helpful to write a menu and also check your stores grocery ads, and local coupons so that you can make sure you’re getting the best price available. Remember, only go down the aisles with items that can be found on your list. It’s almost like you need to have tunnel vision in the grocery store. Stay focused and stay alert! One of the biggest rules that I follow is to avoid buying items just because they are on sale. Frankly, my motto is, “If you don’t need it, just leave it!” In addition, if you happen to see something in the Clearance section remember to check the expiration date, because you don’t want to pick up something that is discounted because it’s old. If you are purchasing items with cash you can only spend what you have on hand, not a penny more. This is why cash is a good option if you tend to overspend. It turns out, that when customers shop with a plastic credit card in hand, it is hard to fully understand how much money they are actually letting go of during each transaction. There are also times when you buy an outfit because you don’t want to take your kids into the dressing room with you because it makes the process take longer. Then, instead of trying it on, you buy it with every intention of returning it later, when you realize it doesn’t do anything for you. Unfortunately, the reality often is, returning things, doesn’t always happen and they outfit eventually, is pushed back into your closet never to be worn. So, as a rule of thumb, don’t buy clothes without trying it own, and when possible, shop alone. If you are a shopping addict or you shop way more than you are comfortable with, then you may need to enlist the help of others. 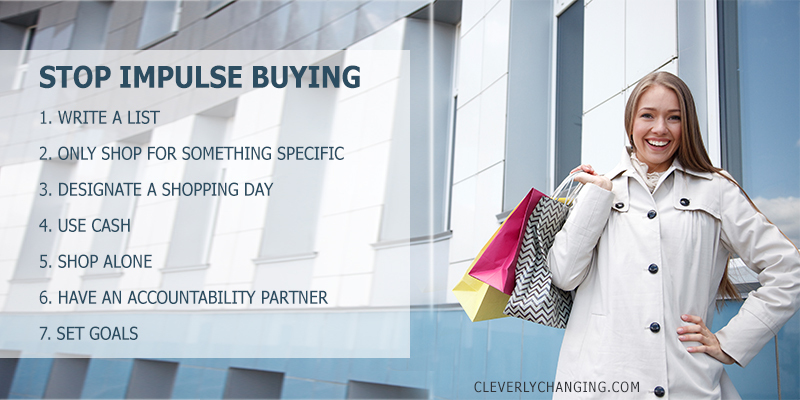 Secure an accountability partner to help you become more successful at saving and saying, “No” to impulse buying. By telling someone about your struggle and your desire to stay on track, people often become more motivated to keep their word and stay on track. Basically, many people are wired with a desire to prove something to others. However, by having an accountability partner you welcome someone else into your space so you can prove to them that you can accomplish your goal. The person will also help by being sensitive to the issue, but at the same time, he or she lovingly tell you when you head down the wrong path. Also, the old saying goes, “there is strength in numbers” so choose an accountability partner wisely. What qualities should your accountability partner possess? They should be honest, firm, and sympathetic. They should also be easily accessible, positive, encouraging, and have your best interest in mind. A couple of years ago, my sister asked me to be her financial accountability partner. For us, the role meant that before she made any big purchase over $500 she would give me a call and together we would discuss the pros and cons of the purchase. People are more likely to be successful when they have pre-determined what they want to do. If you don’t want to impulse buy, recognize that it is a problem that you really want to avoid. You can even create a personal finance journal. Date each entry, write down your purchases, and a list of items that you want to purchase in the future. Then jot down how the purchase made you feel afterward. Cheers to a successful year of no impulse buying and more saving!